Furosemide is a potent NKCC2 (Na-K-2Cl symporter) inhibitor, used in the treatment of congestive heart failure and edema. Cariporide is a selective and potent inhibitor of NHE1 with an IC50 of 30 nM for hNHE1 in CHO-K1 cells. Ambroxol, a substituted benzylamine, is an active metabolite of bromhexine. It is a potent inhibitor of the neuronal Na+ channels. Sparteine, which could be extracted from scotch broom, is a sodium channel blocker and a class 1a antiarrhythmic agent. Sparteine Sulfate, a quinolizidine alkaloid, is the sulfate form of sparteini, which is a sodium channel blocker used as an oxytocic and an anti-arrhythmia agent. Disopyramide is a class IA antiarrhythmic drug which acts via blockade of sodium channels depressing phase 0 of the action potential. Disopyramide possesses significant negative inotropic, anticholinergic effects and enhances AV nodal conduction. GS967 is a potent and selective inhibitor of late INa with anti-arrhythmic actions. A-803467 is a selective NaV1.8 channel blocker with IC50 of 8 nM, blocks tetrodotoxin-resistant currents, exhibits >100-fold selectivity against human NaV1.2, NaV1.3, NaV1.5, and NaV1.7. Amiloride HCl dihydrate is a potent epithelial sodium channel (ENaC) blocker, used in the management of hypertension and congestive heart failure. Phenytoin is an inactive voltage-gated sodium channel stabilizer. Camostat is a trypsin-like protease inhibitor, inhibits airway epithelial sodium channel (ENaC) function with IC50 of 50 nM, less potent to trpsin, prostasin and matriptase. Effect of pharmacological agents capable of increasing intracellular calcium concentration on RSV. HEp-2 cells were infected with RSV strain long at an MOI of 0.1, and treated with a specific Na+/K+-ATPase inhibitor ouabain at indicated concentrations. Supernatants were collected at 48 h postinfection and viral titers were determined by immunoplaque assay. Grey bars represent cytotoxicity of the compounds. The data presented were obtained from two independent experiments. Error bars represent the standard deviations from two independent experiments. Statistical significance between treated and control group were analyzed by t-test (*, p < 0.05, **, p < 0.01). Primidone is an anticonvulsant of the pyrimidinedione class. AmbroxolHCl is a potent inhibitor of the neuronal Na+ channels, inhibits TTX-resistant Na+ currents with IC50 of 35.2 μM and 22.5 μM for tonic and phasic block, inhibits TTX-sensitive Na+ currents with IC50 of 100 μM. Phase 3. Dyclonine HCl is a hydrochloride salt form of dyclonine which is an oral anaesthetic, reversibly binds to activated sodium channels on the neuronal membrane, thereby decreasing the neuronal membrane's permeability to sodium ions, leading to an increased threshold for excitation. Mepivacaine is a tertiary amine used as a local anesthetic. Propafenone HCl is a classic anti-arrhythmic medication, which treats illnesses associated with rapid heartbeats such as atrial and ventricular arrhythmias. Prilocaine is a local anesthetic of the amino amide type. It acts on sodium channels on the neuronal cell membrane, limiting the spread of seizure activity and reducing seizure propagation. Dibucaine HCl is a local anesthetics. Oxcarbazepine inhibits the binding of [3H]BTX to sodium channels with IC50 of 160 μM and also inhibits the influx of 22Na+ into rat brain synaptosomes with IC50 about 100 μM. Ropivacaine HCl is an anaesthetic agent and blocks impulse conduction in nerve fibres through inhibiting sodium ion influx reversibly. Nefopam HCl is a centrally-acting but non-opioid analgesic drug by blocking voltage-gated sodium channel and inhibition of serotonin, dopamine and noradrenaline reuptake. Levobupivacaine HCl, the pure S(-)-enantiomer of bupivacaine, is a reversible neuronal sodium channel inhibitor, used as a long-acting local anesthetic. Triamterene blocks epithelial Na+ channel (ENaC) in a voltage-dependent manner with IC50 of 4.5 μM. Lappaconitine (LC) is a natural diterpenoid alkaloid (DTA), acting as a human heart sodium channel blocker and possessing a wide range of biological activities, including anti-arrhythmic, anti-inflammatory, antioxidative, anticancer, epileptiform etc. Tolperisone HCl is an ion channel blocker and centrally-acting muscle relaxant. Benzocaine is the ethyl ester of p-aminobenzoic acid (PABA), it is a local anesthetic commonly used as a topical pain reliever or in cough drops. Benzocaine hydrochloride is a surface anesthetic that acts by preventing transmission of impulses along nerve fibers and at nerve endings. Procaine is a benzoic acid derivative with local anesthetic and antiarrhythmic properties. Procaine binds to and inhibits voltage-gated sodium channels, thereby inhibiting the ionic flux required for the initiation and conduction of impulses. Mexiletine HCl belongs to Class IB anti-arrhythmic group of medicines, inhibits sodium channels to reduce the inward sodium current. Phenazopyridine HCl is a local analgesic that has been used in urinary tract disorders. 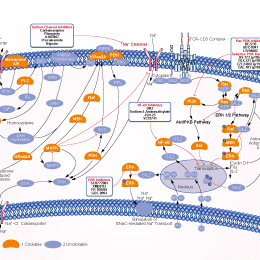 It is an inhibitor of sodium channel protein type 1 subunit alpha. Quinidine acts as a blocker of voltage-gated sodium channels, also an antimuscarinic and antimalarial. Bulleyaconitine A (BLA) is an active ingredient of Aconitum bulleyanum plants and classified as an "aconitine-like" alkaloid. It is a potent use-dependent blocker for both Nav1.7 and Nav1.8 Na+ currents. Chloroprocaine HCl is a local anesthetic during surgical procedures. Vinpocetine is a selective inhibitor of voltage-sensitive sodium channel for the treatment of stroke, vascular dementia and Alzheimer's disease. Ibutilide Fumarate is a Class III antiarrhythmic agent that is indicated for acute cardioconversion of atrial fibrillation and atrial flutter of a recent onset to sinus rhythm by induction of slow inward sodium current, which prolongs action potential and refractory period of myocardial cells. Procainamide HCl is a sodium channel blocker, and also a DNA methyltransferase inhibitor, used in the treatment of cardiac arrhythmias. Veratramine, a major alkaloid from Veratrum nigrum L., has distinct anti-tumor and anti-hypertension effects. It is a good membrane permeant, undergoes rapid passive diffusion, and has a good stability in the gastrointestinal tract during its absorption. Proparacaine HCl is a voltage-gated sodium channels antagonist with ED50 of 3.4 mM.